The 5Zigen Keiichi are JDM Wheels made by SSR Wheels but also with the drift king himself Keiichi Tsuchiya. The 5Zigen Keiichi features 3 piece construction with reverse mounted style. The faces feature a 10 hole design with covered lug nuts. The center cap parts look to have some cool detail on them which is part of what makes older ssr wheels cool; a bunch of random wording and engrish. 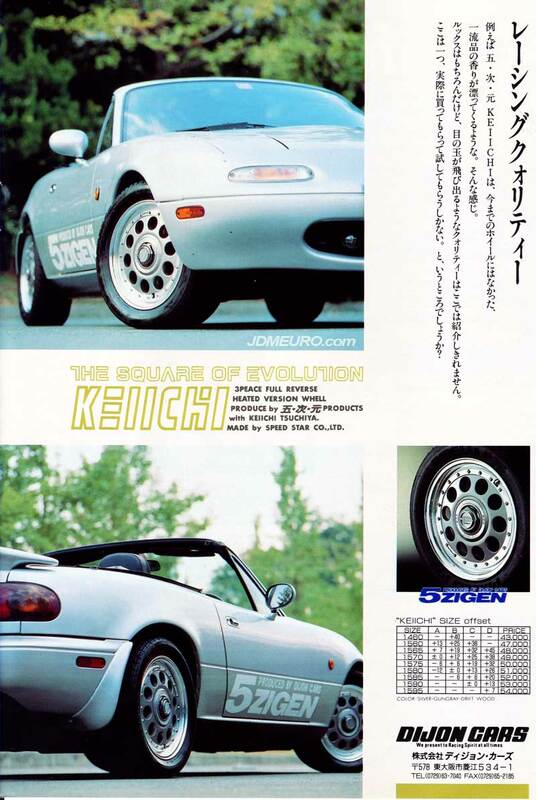 The picture depicts the 5Zigen Keiichi mounted on a NA series Mazda Miata. Made by SPEED STAR CO., LTD.